Autumn weather hit us full on this week. Hurray! I love autumn! After one of the driest summers on record (preceded by one of the wettest winters on record), the rains have returned. Our garden is a testament to just how dry it has been. I love autumn so much! I can’t wait for the leaves to turn more, the nights to get cooler, to dig out the wool knitwear and walk through the crunchy leaves! 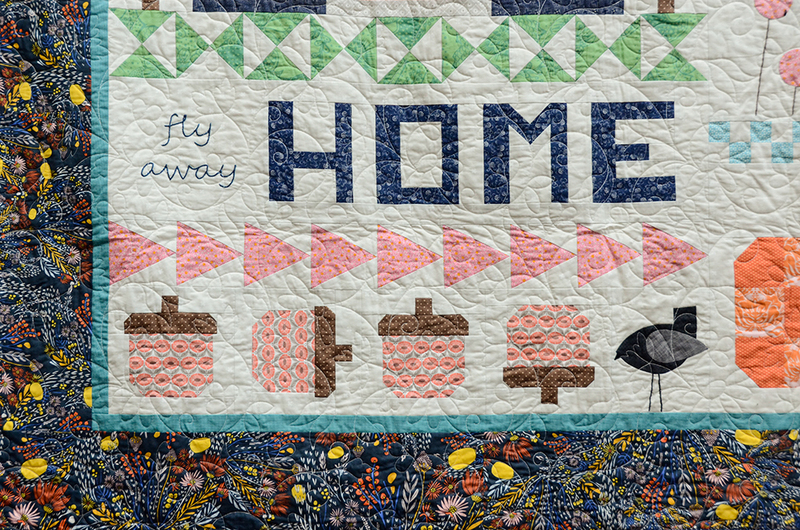 The Fly Away Home quilt was recently unveiled to the Mystery BOM folks as they received the final layout instructions earlier this month. I am happy to announce that the pattern will be released for the general public soon. I am working on the final touches to self-publish a booklet for all who might be interested. An opportunity to pre-order the booklet will be coming soon. Later, there will be an opportunity to purchase the booklet as a digital download, so stay tuned! After designing the quilt for my friends Ellen and Richla, who hosted the Mystery BOM, I went stash diving and made my own version of the quilt. I think I may have purchased about four of the fabrics and the rest came from my stash. I have been having so much fun sewing up my stash and it felt good to mostly use what I had on hand! Fly Away Home is a great pattern for learning new techniques. There is traditional piecing as well as foundation paper piecing, partial seams, y-seams, appliqué, embroidery and letters! There is enough of a variety to keep experienced quilters from getting bored and yet simple enough for beginners to learn a few new tricks. 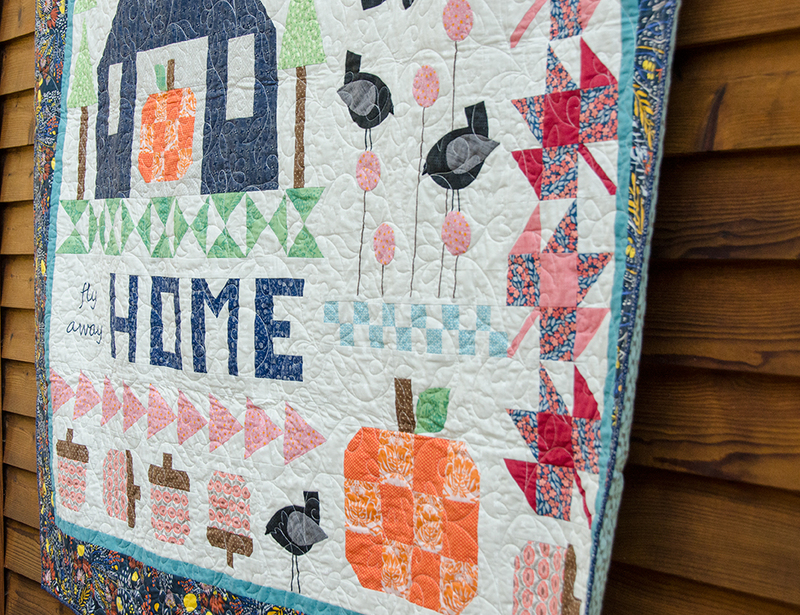 The original quilt was made with Carina Gardner’s Posy Garden collection and a few Riley Blake basics fabrics. Ellen brought her quilt for show and tell to one of the recent sewing group meet ups and hers looks fantastic! 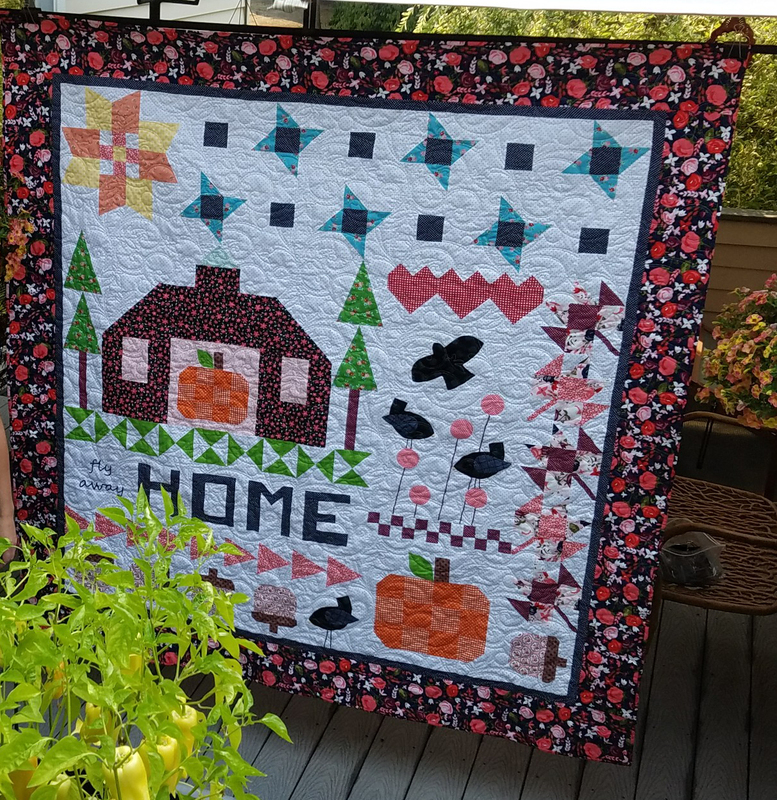 The booklet contains a bonus project using three of the blocks from the Fly Away Home quilt to make this fun Pumpkin Patch quilt. That looks like a fun project. I’m usually a “piecer,” but my most recent has traditional piecing, foundation paper piecing, and hand lettering with marker, as well as a little custom quilting. I quite enjoyed mixing methods and hope to do more of that. A really wonderful collection of quilt designs. Kudos! Very cute! I’ll have to put it on The List, and wish for more quilting time! Would like more info on this when you release. Wow what a wonderful sampler. It represents all of what I love about fall too. And the bonus is beautiful too. Can’t wait to learn more about this booklet. Very sweet little quilt! Good for you in the self publishing! 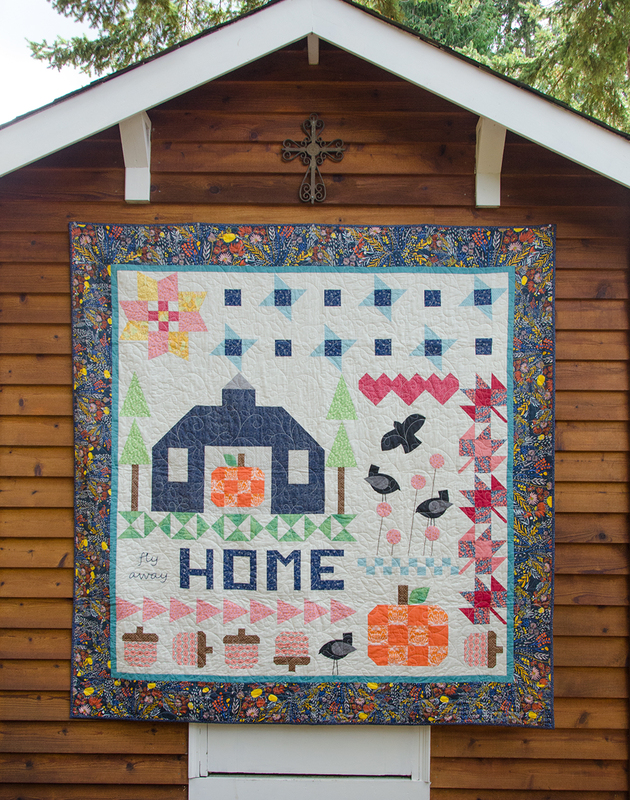 Everything about this quilt is charming, Anita :o) I just love samplers. 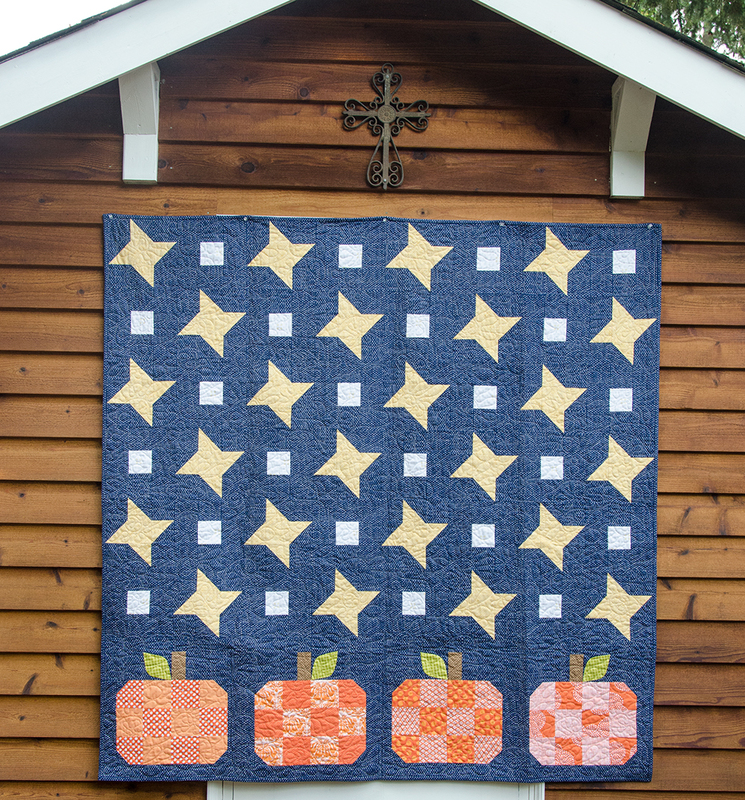 The pumpkin patch option would be great for the quilt back…maybe that’s what you planned. I think it’s fun when the back of a quilt is interesting, too. Finally getting around to reading some favorite blogs. This is one of the cutest samplers I’ve seen, I love everything about it. Sweet as can be. « Fly Away Home Pre-Sale! You are currently reading Fly Away Home Debut at Bloomin' Workshop.